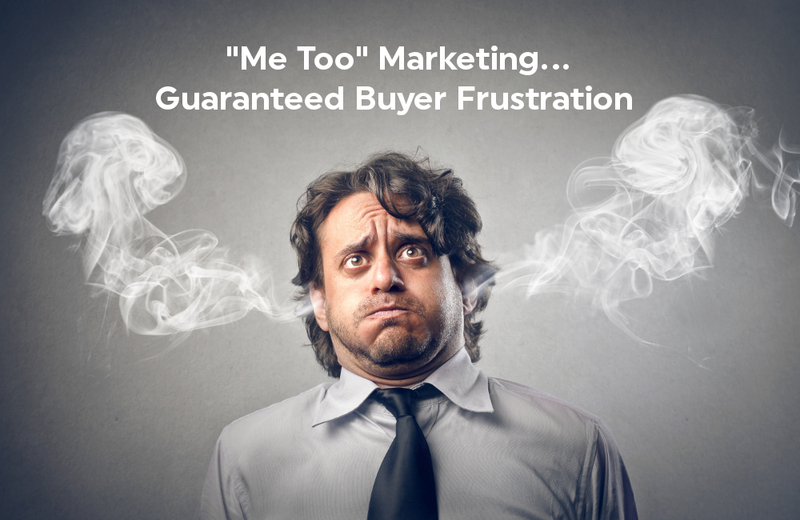 Me Too Marketing… Guaranteed Buyer Frustration – Sellience Blog – Always be Closing! Are you a “me too” marketer? If your sales pitch or marketing message is easily confused with your competitors, then you may be guilty of leveraging a story that is far too like your competitor’s. While not a crime punishable by death, it is a marketing practice that you may want to consider killing off, as it often leads to buyer frustration. Your prospects and clients become inundated with marketing messages, sales pitches, information overload, and a sea of distractions. The more your messaging can stand out, the better your opportunity to thrive. Armed with this knowledge, create website copy and content which leverages your unique “solution-based” sales message. It’s not about the services you offer, but rather the problems you can solve. What other considerations should we keep in mind? • Don’t get so focused on being unique that you confuse visitors with flowery, unclear content. • It’s critical to have a lead capture tool on your site to begin the relationship building process. A simplified contact form is a start, but robust “call-to-action” tools can serve you and your customers more effectively. • You must have a strong call-to-action offer, such as a video, an e-book, Top 10 lists, or some other product(s), solution or offer that motivates them to opt-in. Working hand-in-hand with the tools above, you can begin creating a powerful process to become a trusted resource. • Your follow-up system must be clear and action-oriented. Is the initial outreach manual or automated? Are there multiple paths a potential customer must travel if they show interest in your offerings? A clear mapping of the process can bring to light areas where the customer journey can be simplified. Differentiating your brand is not always easy. Even if you do it successfully, the marketplace may make it hard for you to stand out if your message is not memorable and clear. However, the more times buyers become exposed to your brand, the better chance they will see you as their trusted partner, not just a vendor, especially if your message is strong. A website can become a powerful tool in a company’s digital folio, but it should not be the only form of online engagement between you and your potential buyers. Instead of saying, “Me too…,” embrace a more holistic approach to engaging with your online audience through multiple channels and stand out as a leader, even in a crowded marketplace. If you would like some guidance or if you have questions on your path, feel free to contact me directly at paul@websitesandleads.com.